These portraits of a wealthy Bostonian and his wife and daughter (the youngest of their eight children) are among the most important of the relatively small number that survive from the late seventeenth century in New England. A half-dozen portraits painted in Boston during the 1670s can be attributed to the same anonymous artist, who gave greater attention to costume than to the characterization of the individuals. The colonial painter's deliberate, decorative style shows his awareness of a tradition in British portraiture that derives ultimately from late sixteenth-century iconic representations of Elizabeth I. Research on the sitters and technical examination of the portraits support a theory that the artist updated the Freakes' portraits in about 1674, shortly after he first painted them. It was then that the baby was added and details in costume were changed, probably to reflect current fashion. 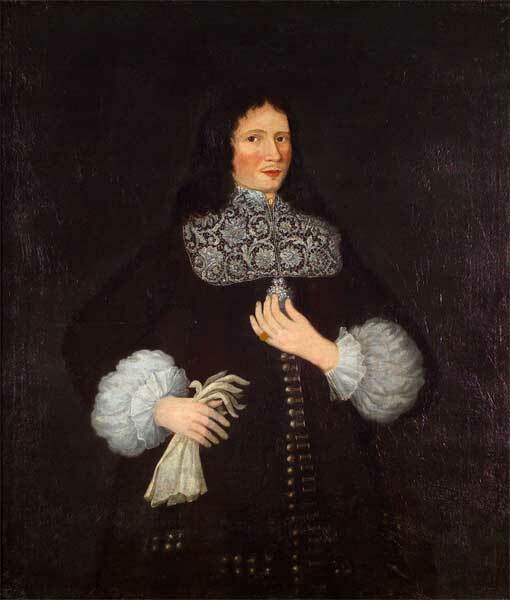 Similar items appear in both the portraits and a household inventory taken in 1675 following John Freake's death: a signet ring, a black coat, and gloves were among his possessions. Also listed were a set of twelve chairs with turkey-worked upholstery (one of which Mrs. Freake is seated upon) and yards of lemon-colored silk that could well have been used to make the child's dress. While little is revealed of the sitters' personalities in these portraits, their personal effects do denote the social and economic status of a prominent merchant and attorney and his family. See the associated painting, Mrs. Elizabeth Freake and Baby Mary.